My first for today was so interesting and moving. Artist Marianne Evans-Lombe, currently from Tulsa, OK, brought her unique performance art to Joplin, in connection with Third Thursday. I had read about this upcoming event, which has a special connection to Joplin, and made sure I was there to witness it. Linda accompanied me, and we not only enjoyed watching the performance, we participated. Marianne creates drawings called body drawings. Light and shadow are important elements of her art and she uses these elements to tell a story. Origin of Painting is the tale of the Greek Maiden, Dibutade, who traces her lover’s shadow, cast upon the wall before he departs, thus creating the first drawing. During the performance, members of the audience participate by having their shadows traced as well, contributing to the story being told. Marianne has performed this show many times, including a 2009 production in Pittsburg, KS, in which Jose Alvarez, of Joplin, participated. After the May 22, 2011 tornado struck Joplin, Marianne learned that Jose, who was a professor at Missouri Southern State University, had died during the storm. She realized she had a photo of Jose and his shadow drawing. Using that image, she created a life sized silhouette of Jose. 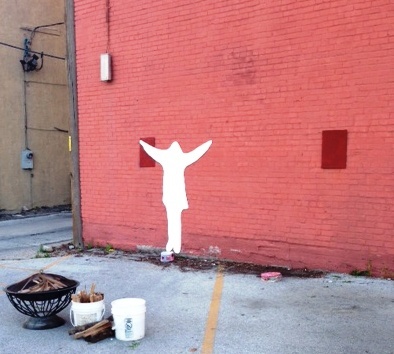 This evening, as dusk approached, a fire was lit in a portable fire pit, and Jose’s silhouette was attached to a large brick wall near Main and 3rd Streets. 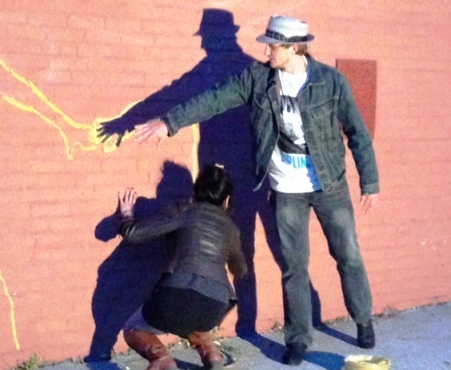 As Marianne traced around his paper silhouette with chalk, the story of Dibutade was read by another woman. The artist then handed the chalk to another person and posed in front of the wall, her hand stretching out to touch Jose’s paper hand. 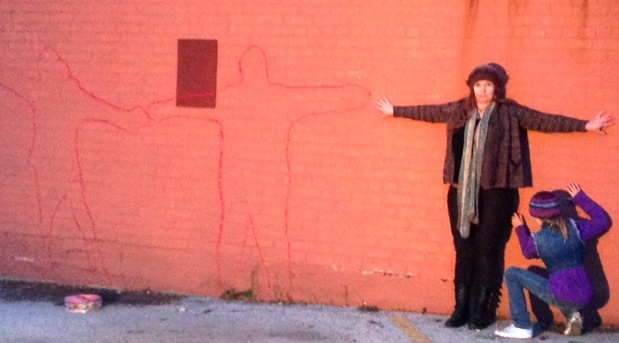 As her outline was finished, Marianne stepped away and the man who traced around her shadow then struck a pose and another member of the audience stepped forward to trace around him. As each person completed the tracing, he or she then posed quietly, hand reaching out to touch the outlined hand of the previous person. Down the wall, the silhouettes progressed, person after person stepping forward to first trace another’s shadow and then be traced as well. Linda and I each took our turn in the production, tracing and being traced. Darkness fell and a man graciously continued to hold a flood light so that the shadows were cast starkly against the brick wall. Some of the younger participants were very creative in their poses. 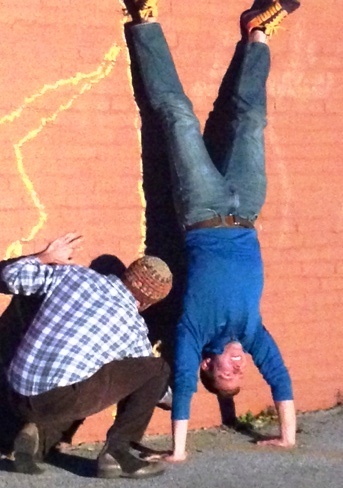 One young man did a handstand. Another wore a jaunty hat. Still another balanced a ball on his palm. Live music provided a soft and gentle background for the performance being carried out before us. As the last silhouette was traced onto the wall, we all picked up pieces of colored chalk and drew in and around our outlines. I drew a large green heart within my silhouette and added symbols from my last three years: a butterfly, a dragonfly and a bird. Linda also drew a heart and wrote the word JOPLIN within her silhouette. We were both so glad we attended this very special performance and stepped forward to participate as well. I will return tomorrow, in daylight, to take a picture of the long line of silhouettes moving down the wall. Jose’s white paper figure stands at the head of the line, a beautiful silent reminder of a life loved and lived here in Joplin.